The public employees responsible for overseeing $600 million in contracts to build healthcare.gov were inadequately trained, kept sloppy records, and failed to identify delays and problems that contributed to millions in cost overruns. That’s according to a new government audit, published today. It reveals widespread failures by the federal agency charged with managing the private contractors who built healthcare.gov. The audit is the first to document, in detail, how shoddy oversight by the Centers for Medicare and Medicaid Services (CMS), which manages federal health programs including Obamacare, contributed to the website’s early struggles. 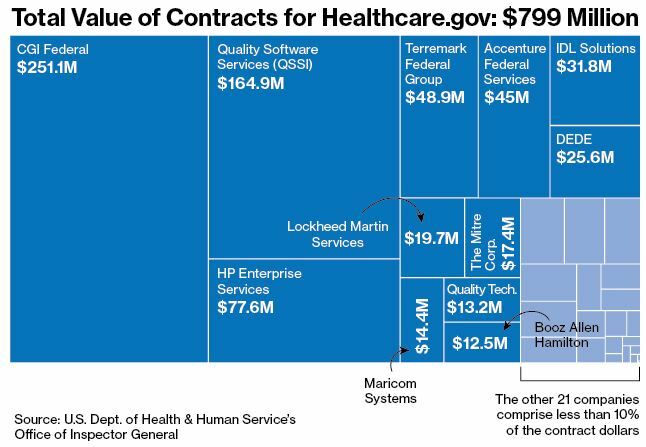 To develop healthcare.gov, CMS hired and managed private companies to create vast, interlocking software systems that would allow consumers to shop for insurance policies. According to the report, issued by the agency’s inspector general, lapses in oversight of those companies started early on—well before the website’s limping debut, on Oct. 1, 2013. The site faltered for months, frustrating consumers until a scramble to repair it ultimately allowed millions to enroll in health plans. Health and Human Services Secretary Kathleen Sebelius on Tuesday asked the department’s inspector general to investigate the contracting process behind the government’s botched rollout of the online health insurance exchange in October. In a letter to Inspector General Daniel Levinson, Sebelius said it’s critical to understand the factors that contributed to the failed launch of HealthCare.gov. “I am requesting that your office undertake a review of the work of our contractors, and the management of and payments to those contractors, in the development of HealthCare.gov,” she wrote. Specifically, she requested an investigation of the acquisition process; contractor selection and project management; contractor performance and monitoring; and payments to contractors throughout the process. Problems with healthcare.gov, the federal website for residents of 36 states whose governments declined to build their own healthcare exchanges, have set off a round of recriminations against federal information technology management and acquisition. The New York Times, in a Oct. 12 article, says that regulations underpinning healthcare.gov were delayed for political reasons until after the November 2012 election and technical specifications were also slow in coming, meaning that the website’s largest contractor, CGI Federal, didn’t start writing code until this spring. The Centers for Medicare and Medicaid Services also took on itself the role of system integrator, although some doubted it had the technical capacity to take on that task. Systemic problems, such as lack of technical expertise, are the stuff of much debate over what went wrong. “Many agencies are stuck in a technology time warp that affects how projects like the healthcare exchange portal are built,” writes Ars Technica’s Sean Gallagher, expressing a common opinion that cites as fundamental causes long procurement cycles, slow adoption of new technologies and the problem of a large installed base. Gallagher also notes turnover among top executives, each of whom brings “some marquee project to burnish their résumés,” meaning that real change is difficult to implement.